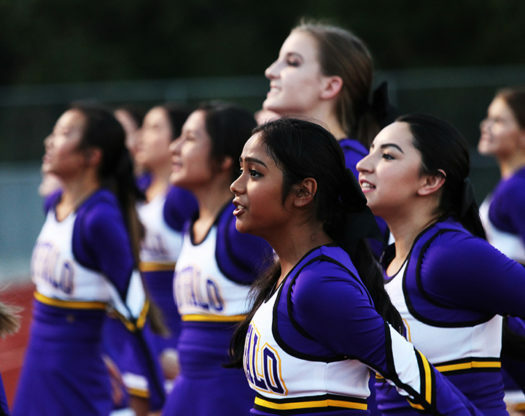 The cheerleaders perform at an early-season game. They practiced for games as well as competition. Cheerleaders hit the competition floor last week, vying for a spot in the finals of the state UIL cheer competition. In an event that has been growing for the past three years since it started, the squad found themselves missing the list for finals, but knew they had tried their best. The squad competed against 76 teams in the 3A division and placed 31st overall. Before they could think about finals, the cheerleaders had to perform in prelims. They presented their crowd-leading cheer, band chant, and fight song. The cheerleaders had to face obstacles in the days leading up to the contest. Two cheerleaders were unable to compete at the last minute. However, the 13-person squad continued to adjust. Ever since football season ended, Lack has been holding official practices for her state team at least two nights a week. The cheerleaders scored an average of 83.4 out of 90 for crowd-leading. However, scores on their band chant and fight song were less than ideal. First-year competitors were excited for the chance to compete in the state contest.